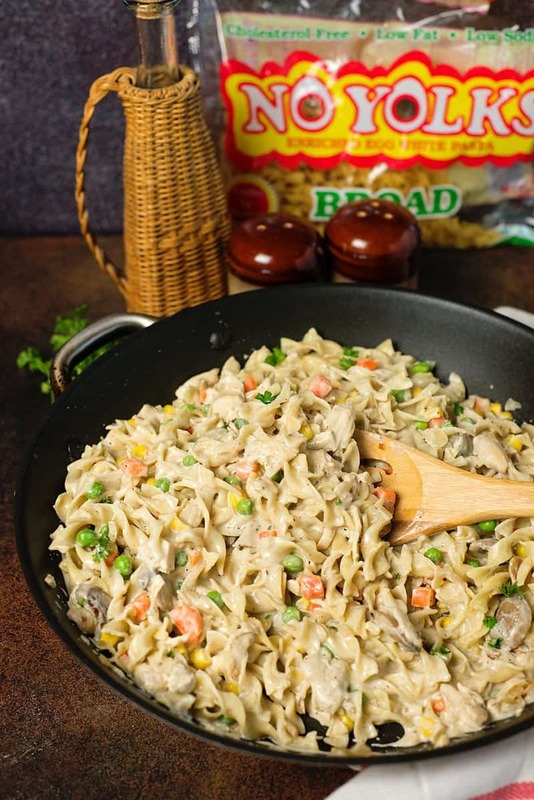 The entire family will love this Creamy Chicken Noodle Skillet Recipe. 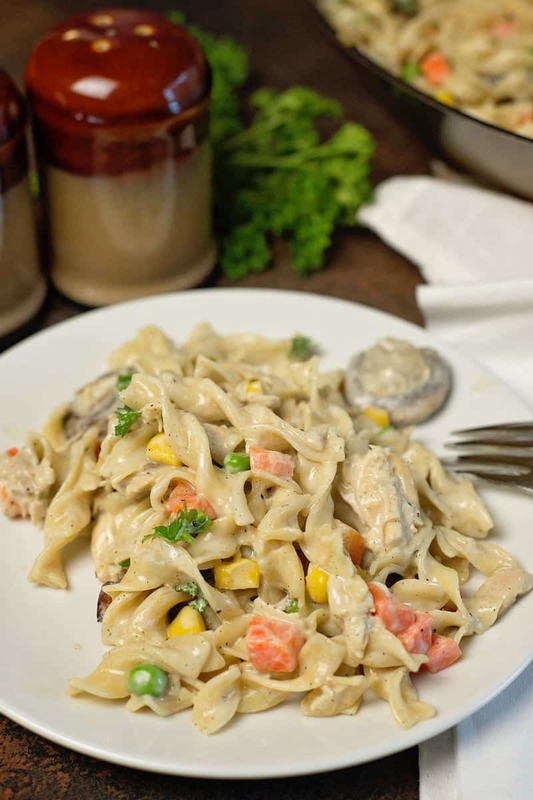 It’s quick to make and is a delicious, one-skillet comfort meal that tastes like chicken pot pie, but without all the work! My kids love noodle dishes and we probably have them in some sort of recipe (or just on their own) a couple times a week. I love this type of recipe as it cooks up in a flash and the ingredients are very interchangeable, so it easier to cook with what you have on hand. 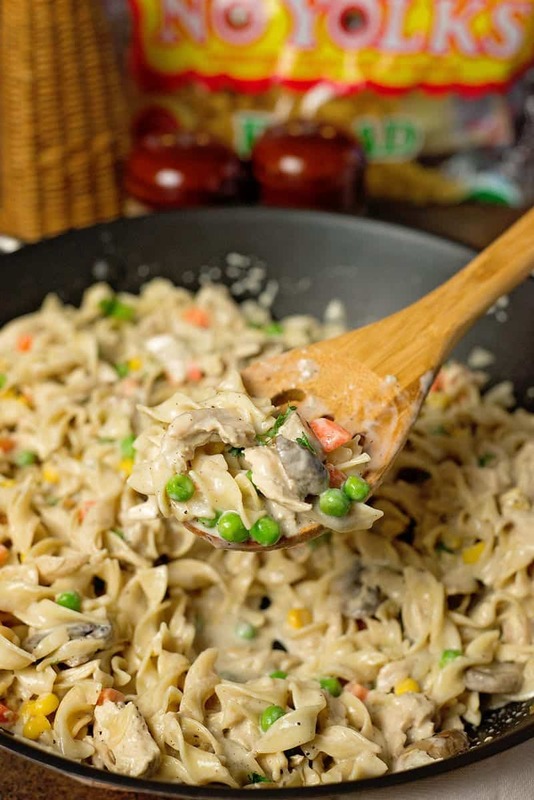 This Creamy Chicken Noodle Skillet recipe will definitely not disappoint, it’s full of chicken, No Yolks Noodles, mushrooms, peas, carrots and corn and tastes almost like chicken pot pie – without the cust and definitely without all the work. The recipe comes together using only one skillet (yea, fewer dishes to wash!) and only takes about 20 minutes from stovetop to table. Truthfully, I tend to stick to the tried and true recipes when it comes to the family meals on busy weeknights. We have so much “on our plates” these days, it’s easier to just have a few good recipes in my repertoire that I can make over and over again. (and yes, I had to google the spelling for repertoire, lol.) 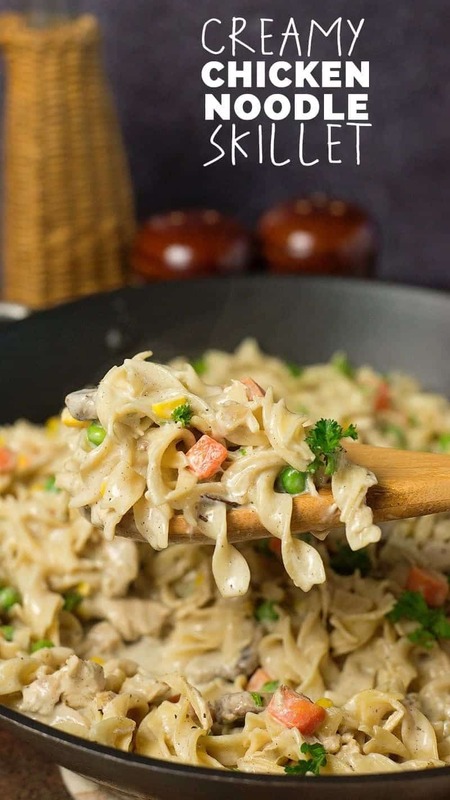 You truly can’t go wrong with this Creamy Chicken Noodle Skillet or the 20-Minute Meatball Stroganoff I shared a few weeks back. 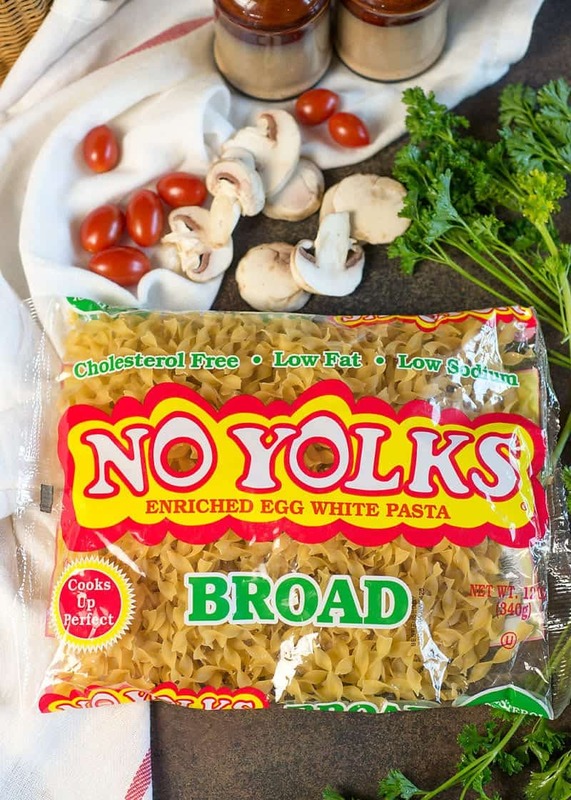 No Yolks Noodles come in different sizes and shapes so they’re great in almost any recipe. (Broad, Extra Broad, Fine, Kluski, Dumplings, and even Stir-Fry – which I can’t wait to try out). They’re made with egg whites which makes the noodles low in cholesterol, fat and sodium. Need a few new recipe ideas for dinner time this week? You can find tons of recipes and videos on the No Yolks recipe page. 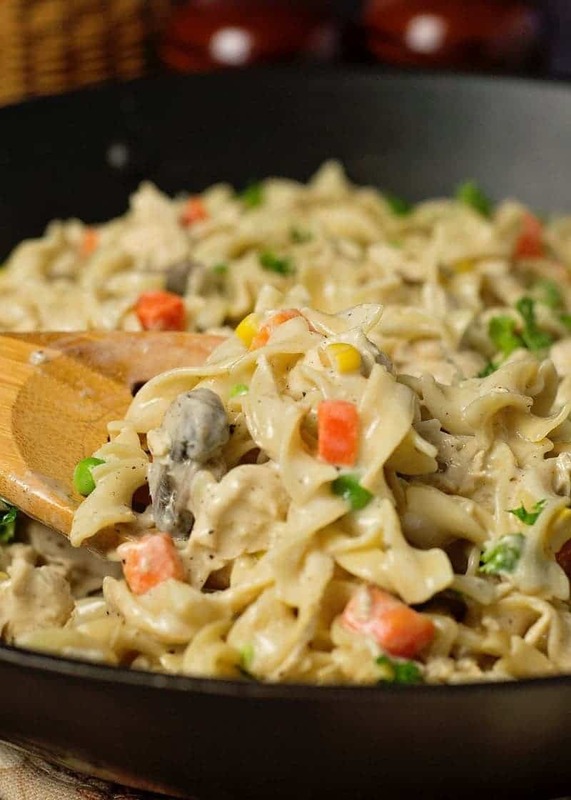 Everyone will love this Creamy Chicken Noodle Skillet Recipe. 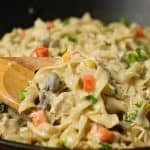 It’s a quick and easy one-skillet meal that tastes like chicken pot pie, but without all the work! Add chicken broth, poultry seasoning, salt, pepper and noodles to skillet. Cover and cook for 6 minutes, stirring occasionally. Stir cream into the skillet, add chicken. Reduce heat to med-low. Stir in corn, peas and carrots. Cook an additional 3 to 5 minutes until liquid thickens a bit. Remove skillet from heat, as the sauce cools it will thicken a bit more. Season to taste with more salt and pepper as needed. Optional: For faster thickening, mix 1/4 cup additional chicken broth with 1 tsp cornstarch until smooth. Mix broth/cornstarch mixture into the skillet, cooking for another few minutes. Garnish with fresh parsley and serve with biscuits, yum! Don’t skimp on the mushrooms, onions, garlic and butter in step one – this is where much of the flavor comes from! After the final cooking time, give it a taste and add additional salt, pepper and poultry seasoning as needed. This looks so delicious. I am going to have to give this a try!